It’s fabulous Friday… fabulous because tomorrow it’s the weekend! That means plenty of yummy cake and biscuit trialling 🙂 What’s so good about this flapjack? Apart from it being DEGF (Dairy. Egg. Gluten. Free.) and tasting sooo good you want to eat it all before it’s even out of the oven!? Well as if that wasn’t enough! This flapjack is chocolate flavoured! 🙂 This recipe takes a bit of planning as the chocolate base dessert needs time to set but the good thing is you then have a chocolate dessert staring at you every time you open the fridge! :-p That means you’re getting two recipes today… or three if I add in the raw chocolate flapjack version! Lets start with the chocolate base dessert! Put the almonds in a bowl and cover with the water. Leave for as long as possible but at least two hours. Tip the almonds (skins too) and the water into a food processor, add the linseeds and cacao. If you’re after a chocolatey fix, chocolate base is a great fridge accessory! You can eat it straight from the bowl or stir it into porridge, spread it on toast, eat with chopped banana, smother it on pancakes or anything else where chocolatey saucy spready goodness is needed! Now. 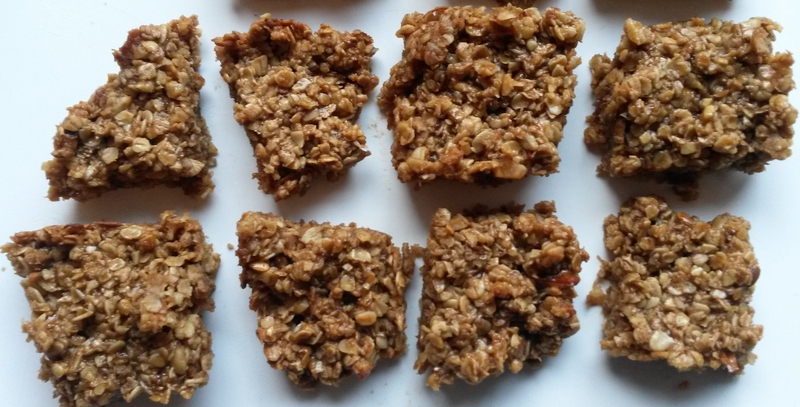 The flapjack recipe! Melt the coconut oil, agave syrup and coconut sugar in a bowl (I used the microwave). Mix to combine. Add the chocolate base and stir. Tip in all of the oats and stir until all of the oats are coated. Tip into a greased or lined tin (or cheat and use a glass ovenproof dish which shouldn’t need greasing) and press down firmly with the back of a spoon. Bake at Gas Mark 5 (190c / 375f) for 10-15 minutes. 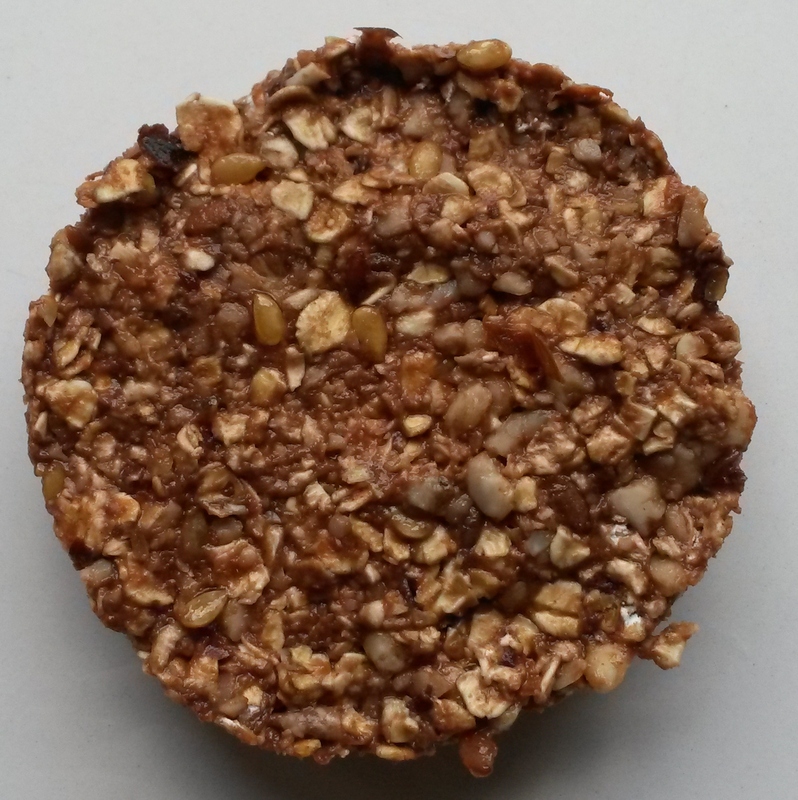 The flapjack should be starting to change colour around the edges. Remove from the oven and score into pieces. Leave to cool in the tin for ten minutes before cutting and placing in your mouth on a plate! 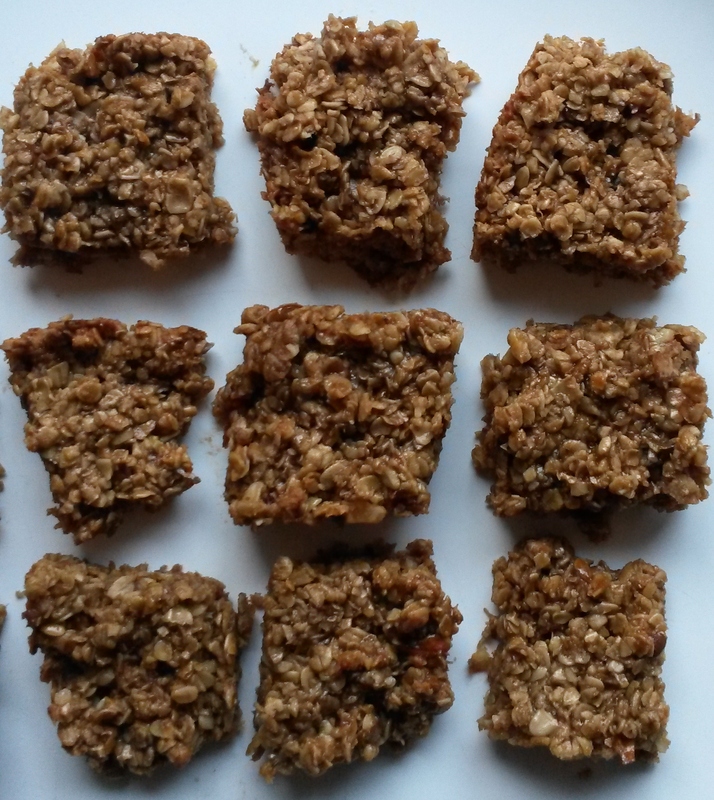 IF… you want a raw recipe for flapjack it’s very short and simple (please correct me if this isn’t raw as raw not-baking is something new to me)! Simply mix the two ingredients together and press firmly into a mould (I used a ramekin lined with clingfilm). Place in the fridge until set. Carefully remove from the mould (if you haven’t already) and enjoy! Thank you SOOO much! Look out for my response soon!